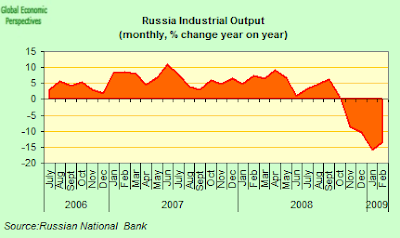 News from Russia's crisis stricken economy has certainly been a lot less dramatic of late, but even as Finance Minister Alexei Kudrin seeks to reassure us that everything is coming back under control and that lending in the Russian economy is "in full swing" once more, doubts remain. Are we simply seeing the temporary impact of all those stimulus measures that have been put into place, or is a more general recovery possible at this point? Certainly if we come to look at the purchasing managers indexes we can see that things were better in February than in January. 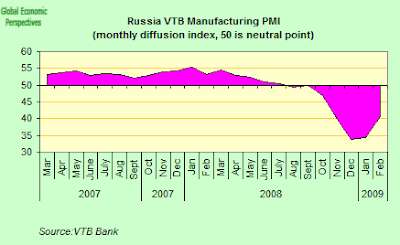 The VTB services index rose to 40 in February from 36.8 in January, although since any reading under 50 indicates contraction, it is clear that Russia's services industries are still shrinking at a pretty hefty rate. The manufacturing PMI also improved slightly, rising to 40,6 from January's record low of 34.4. 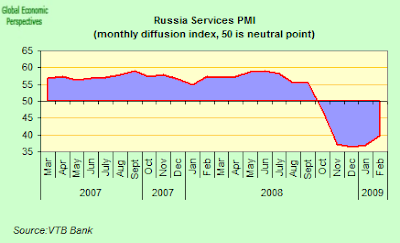 This impression gained from the PMIs is also confirmed by the latest data for Russian industrial production, which dropped an annual 13.2 percent in February, the fourth month of decline, but still rather better than January's 16% decline. And there are other signs of stabilisation, since job losses are now flatlining at 300,000 per month, while nominal wages have risen from January's eight month low. Even a 14.1 percent fall in capital investment in January was less than expected. 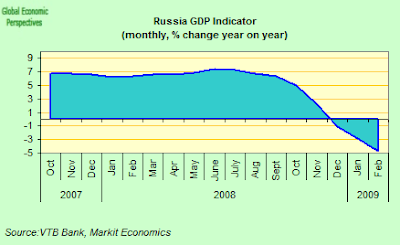 However, whatever the improvements, the Russian economy continues to contract, and the February reading for the Markit GDP Indicator fell to an annual contraction of 4.7%, down from a revised 2.9% drop in the first month of the year. And indeed the contraction may be even sharper, since Economy Minister Elvira Nabiullina informed the Russian government last week the Russia's gross domestic product is likely to contract by 7 percent year-on-year in the first quarter, according to Ministry estimates. However the ministry is still sticking to its forecast for a full-year contraction of just 2.2 percent, suggesting they continue to hope for a dramatic turnaround in the second half of the year. So the data we now have to hand for the first two months of 2009 point to a further outright contraction over the first quarter, following on the back of the sharp growth downturn in the final quarter of last year. The PMI-based Indicator of year-on-year GDP has now fallen continuously since hitting 7.4% last June and has been in negative territory for the past three months. The Total Activity Index rose to 38.8 in February from 32.1 in January, indicating a further sharp decline in output, although this was the weakest rate of deterioration since last October. Russia's economy will contract 2.2 percent this year after 5.6 percent growth in 2008, according to Economy Ministry estimates, and the government anticipates a budget deficit equal to 8 percent of gross domestic product, its first in a decade. However a number of factors lead towards the conclusion that this estimate for 2009 GDP growth may be rather over optimistic. Only today Ford Motor Co., whose Focus is the top-selling western car in Russia, cut its industry forecast for the country, saying sales may plummet as much as 50 percent this year in what used to be their second-fastest growing auto market. Ford, which stopped production at its St. Petersburg plant for one month from mid-December to mid-January, is looking at further adjustments to “plan realistic inventories,” according to the company statement. Russian car sales in the first two months of 2009 were down 36 percent to 252,314 vehicles. The Russian government has responded to the fall in car sales by pledging to spend about 220 billion rubles to aid the industry, offering to subsidize loans on car purchases and making plans to upgrade at least 12 percent of the federal car fleet. The government also raised import duties on cars and trucks to encourage domestic production. On another front Russian wage arrears climbed by 16 percent in February, the second consecutive month that this figure has risen. Total unpaid wages were 8.09 billion rubles ($235 million) on March 1 following a 49 percent in January, according to the Federal Statistics Service. Half a million people were affected by the delayed payments, with 47 percent of the money overdue coming from the manufacturing sector. The unemployment rate rose 8.1 percent in January, the highest level since March 2005, with the total number of unemployed up by 300,000 and reaching 6.1 million people. 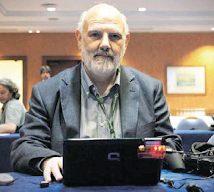 The work of trying to contain the damage continues on an almost daily basis. Earlier this week it was announced that Russia’s Trade and Industry Ministry have approved a list of 600 companies who may apply to receive state funds during the economic decline. The ministry, whose budget before the crisis reached 120 billion rubles ($3.59 billion), is already “actively” involved with a third of the companies on the list.